I am a Maharashtrian..And I am proud to be one. But that's not the topic of discussion today, or rather even in the future. Jokes apart, let me give you a little background about this day. The Mughal Empire an imperial power in the Indian subcontinent from about 1526 to 1757 enriched India in many ways. Whether it's the legendary Taj Mahal, the Red Fort, the Pearl Mosque or even the Lahore Fort to name a few. But by the end of the 17th Century, internal dissatisfaction and many other cultural and religious issues had weakened the Mughal Empire. Shivaji Bhonsale, (later coronated as Chhatrapati Shivaji Maharaj) an aristocrat of the Bhonsale Maratha Clan led the Marathas against the Mughals to establish a Hindavi Swarajya meaning Self Rule of the Hindu People. In Shivaji's reign, the power of Marathas had reached its peak and covered almost one third of the Indian subcontinent. However, after the Third Anglo-Maratha War, the empire ended and most of Maharashtra became part of Bombay State under the British Raj. Post Independence demanded a lot of reorganisation of the regions in India. Dr B. R. Ambedkar, the chief architect of the Indian constitution was of the opinon that states should be reorganised on the basis of language. Hence, he submitted a memorandum to the Reorganization Commission to this effect, and the Commision created the current Maharashtra state on 1 May 1960 known as Maharashtra Day. 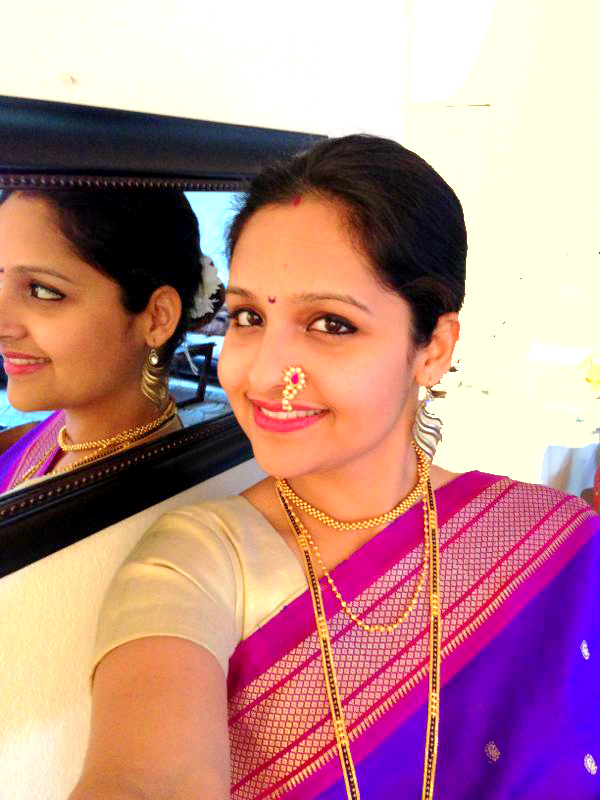 Supriya of My Neonish Life..chk her blog out if you have not already. She was sweet enough to put this Maharshtrian look together for So-Saree's sake. Scroll down and see for yourself. 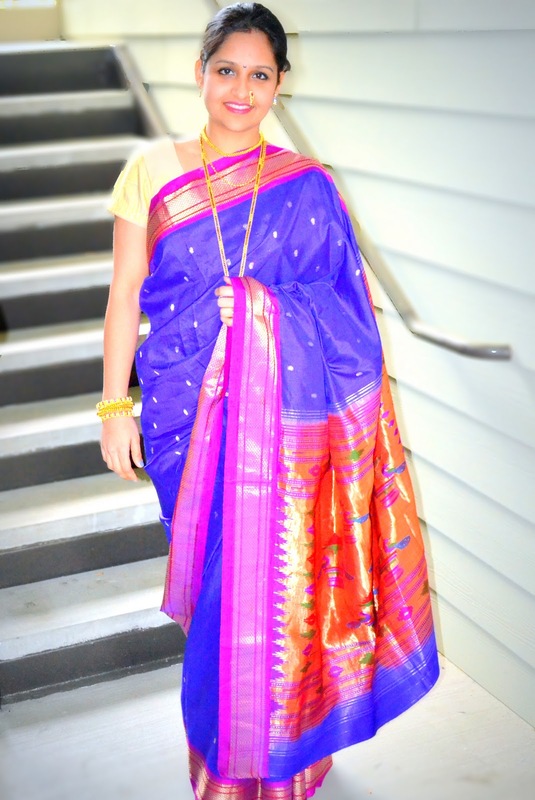 Supriya has draped a Paithani, a typical Mahrashtrian saree named after Paithan town in Aurangabad in Maharashtra where they are woven by hand. The pallu or the trail (as some of my Non-Indian frens call it) of the Paithani typically had motifs in the shape of either parrots, peacocks or lotus. But now newer and different designs are also been assimilated in their designs. The Border of the Paithani is also very typical, and most of them will have the similar square pattern. Paithani is made from the finest of silks and was considered the richest saree of Maharashtra, as originally they used pure Gold threads to make its zari, and the cheaper variation used Silver. The long black bead Necklace that she is wearing is called a mangalsutra, and her nose ring aka Nath are the important aspects in the styling of a Maharashtrian Married Lady. The choker necklace called Thushi, again a Maharashtrian speciality, and the crescent moon bindi on Supriya's forehead completes the Maharashtrian look, which she has pulled off so effortlessly. Thank you so much Supriya, I can't thank you enough. Thnx Sita..but that's not me..it's my fren Supriya. This looks is breathtakingly gorgeous. The colors are amazing. Your friend couldn't be any more beautiful. She is clearly doing this holiday justice. Thnx Jennifer..coming frm u..it means a lot. Pretty pictures, the information is an added bonus! I am proud maharashtrian too :) your friend is looking pretty in paithani! ekdum asssal marathi mulgi and that nath is so cute! Supriya's saree is beautiful and so is she! I have Paithani saree and though it is very old now, I love it so much. I wore that saree on my elder bro's reception! Wow..Juneli! I m yet to own my dream Paithani..just cant find the right one for me. Shes looking very pretty!! Happy Maharashtra day!! Thank u...on Supriya's behalf of course. Thnk u..again on Supriya's behalf. I am a proud maharashtrian after seeing this..
i love traditional weaves they look so rich.. your friend has draped it so well! Aditi!!! Its my pleasure!! Thanks for having me here. I feel honoured!! Love you!! Muah!! Hey Beautiful..r u seeing the kind of response ur pics r getting me..! PPl think it's me who's in the pics. I wudn't blame them..when u have sum one as pretty as u in the pics..no one wud care to read the post. Wow! 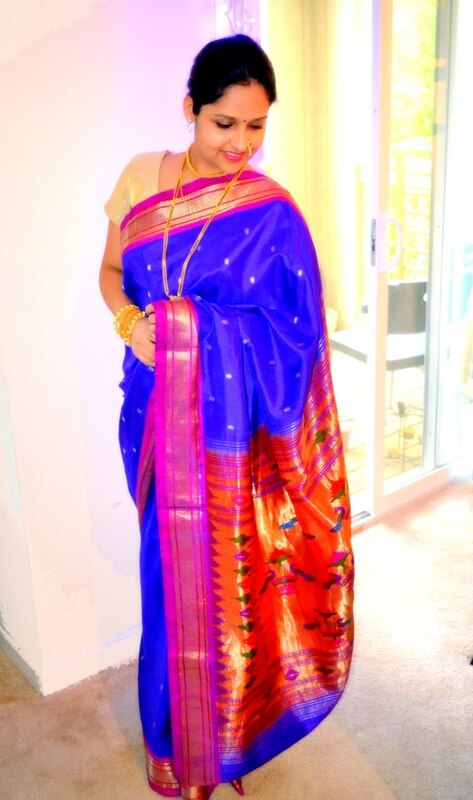 Supriya looks gorgoeus! I have always loved nose rings of this kind. Hey gurl, you looking beautiful and royal blue is one of my favorite color... <3 Its suits you. Thnk u..but it's not me. OMG! I have no word to describe how beautiful you look in this bright blue saree! You are beautiful! Hey girl..it's not me..it's my Beautiful fren Supriya. Glad to be back on the blogosphere...been caught up with a holiday and then 2 family weddings back to back....but am back now with hopefully a post soon! 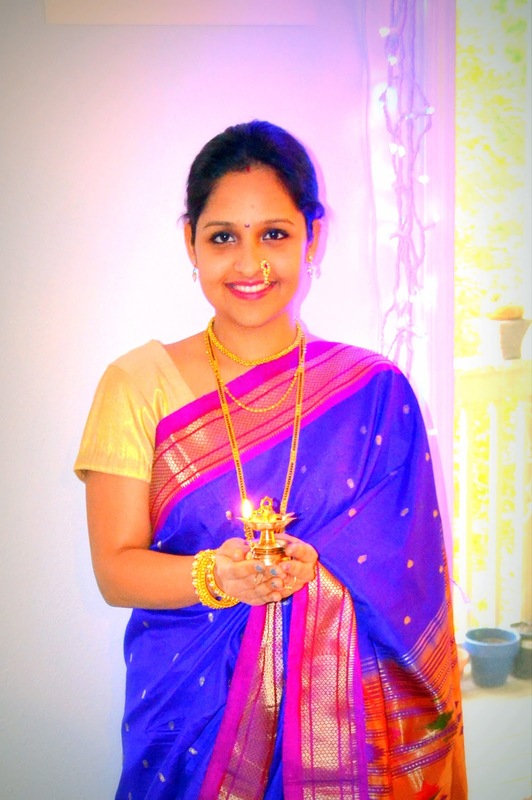 This post is simply awesome!I'm a great lover of tradition silks like the paithanis,balucharis(bengal) and south kanjivarams and was nice to see supriya in a traditional outfit! Hi Shreya..glad u r back..i missed u so much. Glad u read the post. waiting for ur new post. Aww!I missed following your posts too! Back with a new one! u look stunning and love how u wear ure cultural gear with so much elan and grace. Always admired the Maharashtrian outfits in movies. Thnks so much... n i love ur blog. what a gorgeous look, the color of the sari is so lovely !! She looks beautiful! Love the color! Happy Maharashtra day to you! I didn't even knew such a day exist:-)!!! Hope you are having a wonderful day! With BullionVault you can acquire physical bullion by the gram at current spot prices. Your gold and silver may be stored in 1 of 5 secure international vaults. And you may trade it online or withdraw physical bars.